Exotic Disease Caused by Fungus, First Identified in US in 2011, Found in Garden City Last Week; Pathogen Confirmed by Cornell University. July 11, 2013 – East Meadow, NY – Cornell Cooperative Extension of Nassau County (CCE-NC) reports the recent confirmed discovery of the presence of Calonectria pseudonaviculata, in Garden City, New York. The fungus causes what is more commonly known as “boxwood blight disease.” A local resident delivered the infected plant material to the CCE-NC East Meadow Farm Diagnostic Center on July 2, 2013. The CCE-NC diagnostics team identified the boxwood blight and transported the sample to Cornell University’s Plant Pathology Laboratory at the Long Island Horticultural Research and Extension Center (LIHREC) in Riverhead for confirmation of the findings. This aggressive new exotic disease affects boxwood (Buxus) on Long Island, and has been detected in 10 other states, including Connecticut. According to Cornell-LIHREC Plant Pathologist Margery Daughtrey, boxwood “blight has also been seen in Oregon, North Carolina and Virginia, where boxwood are grown by large commercial nurseries.” The fungus that causes the blight, Calonectria pseudonaviculata, was first identified in the U.K. in 1994, according to Daughtrey, and discovered in the U.S. in 2011; it also has been found elsewhere in Europe, as well as in Canada and New Zealand. Boxwood are a longstanding landscape element in many U.S. residential settings, and especially common at older homes and estates throughout Nassau County. They are popular evergreen shrubs because they are easily shaped by shearing into a wide variety of forms ranging from neat formal look hedges to boxes, balls and whimsical topiary shapes. Boxwood blight is difficult to positively identify in the field, because symptoms are similar to several other diseases common to boxwood, making positive identification by a trained professional and diagnostic lab essential. The disease favors moist spring and fall weather conditions. Early symptoms include small black spots and cankers on leaves and twigs. Temperature and moisture levels affect the rate of disease progression, which can cause brown leaf spots and brown tips, leaf drop, bare twigs and whole sections of plants to die in less than one week, according to CCE-NC diagnostician, Vincent Drzewucki, who first identified the recent blight sample. The June 2013 precipitation for the New York area was more than four-times that of 2012 and one of the ten wettest Junes on record, which may exacerbate the activity of the fungus causing this disease. Daughtrey has noted the large, sticky blight spores are likely to migrate only short distances, from yard-to-yard rather than county-to-county. The Garden City resident who brought the sample to Drzewucki at the East Meadow CCE-NC diagnostic center reported the shrubs appeared healthy just one week before she noticed leaf drop and dead branches throughout her plantings, which prompted her to obtain expert advice at the CCE-NC Horticulture Center at East Meadow Farm. All boxwood ornamental species are considered to be susceptible to the voracious fungus. The American boxwood appears to be among the most susceptible varieties, and the classic English boxwood is the most impacted of all, Daughtrey told the Westchester County Journal News in April, and concluded that we may want to move away from English boxwood and grow more of the less susceptible species. According to Daughtrey, not only is boxwood affected by this blight, but Sarcococca (sweet box) and pachysandra as well. Healthy, well-established boxwood are less susceptible to blight, but those added to landscapes in recent years should be watched closely. Daughtrey suggests avoiding pruning into tight, round shapes, and allowing branches and leaves to get more air flow and circulation, with plenty of space for each shrub if possible. Pruners should be cleaned between shrubs. Locating boxwood plantings in full sun also seems to help, along with the avoidance of overhead watering, she said. Daughtrey also advised to keep mature and valued boxwood specimens away from new boxwood plantings. If signs of the disease appear on boxwood, aggressively prune out all diseased branches in dry weather, and remove all diseased leaves. Do not compost any materials from infected boxwood or other species; bag all affected cuttings and leaves for trash removal. If you suspect a blight infection, consider clipping a sample and seeking professional diagnostic assistance immediately. Accurate identification and prompt action is the key to controlling this disease. 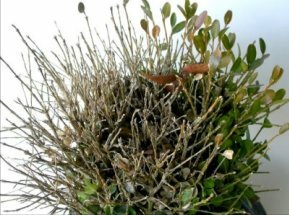 There are a variety of cultural practices that can positively impact boxwood stricken with this disease. For a free boxwood blight fact sheet, other Home Grounds Fact Sheets, diagnosis services (for boxwood blight or other landscape conditions), answers to gardening questions, soil testing, or home and garden pest identification, please call the Nassau County Horticulture Information Hotline at 516-565-5265 (ext. 7), or visit the CCE-NC Horticulture Center at East Meadow Farm, 832 Merrick Avenue, East Meadow, NY, Tuesdays, Wednesdays, Thursdays and Saturdays, 10 a.m. – 1 p.m. and Thursday evenings 4 – 7 p.m. Please note the East Meadow Farm facility will be closed temporarily on the following dates as another cost-reduction measure implemented due to continued county budget cuts: July 11th (today) and 23rd; August 8th and 27th; and September 12th and 26th. Images courtesy of Margery Daughtrey (Cornell-LIHREC) and Virginia Tech Pest-Disease Clinic. CCE-NC is an educational subordinate governmental agency association that provides research-Building Strong and Vibrant New York Communities Cornell Cooperative Extension in Nassau County provides equal program and employment opportunities based information and educational programs designed to build strong and vibrant communities. CCE-NC is also a §501(c)(3) nonprofit organization committed to building healthy lifestyles and healthy communities by conducting educational programs that connect Cornell University resources to community needs for all Nassau County residents. CCE-NC has been educating and disseminating information since 1914, through funding and resources provided by Nassau County, New York State (through Cornell University), USDA, a variety of grant partnerships, and direct financial support from generous donors who support our nonprofit public service mission. Subject: LongIsland.com - Your Name sent you Article details of "Aggressive Boxwood Blight Disease Confirmed Recently on Long Island"